When my initial avocado frosting recipe was a success, I naturally progress to adding avocados to my cake recipe. I couldn’t quite picture vanilla avocado cake layers, so I ended up incorporating them into my go-to chocolate layer cake recipe. I decided to use the same strategy as before, swapping the butter for avocado, using a 1:1 ratio. The chocolate cake batter ended up having a similar consistency, and baked up very nicely! I leveled the fully cooled layers, and then tackled my next challenge. While I loved the way the avocado frosting tasted, I wanted it to be a bit stiffer, so that it would be easier to frost with. I decided to use some of my American buttercream to act as a dam, to ensure all the wonderful avocado frosting stayed in place. Even with the normal buttercream, each bite of cake still had a faint (and refreshing taste) of avocado. 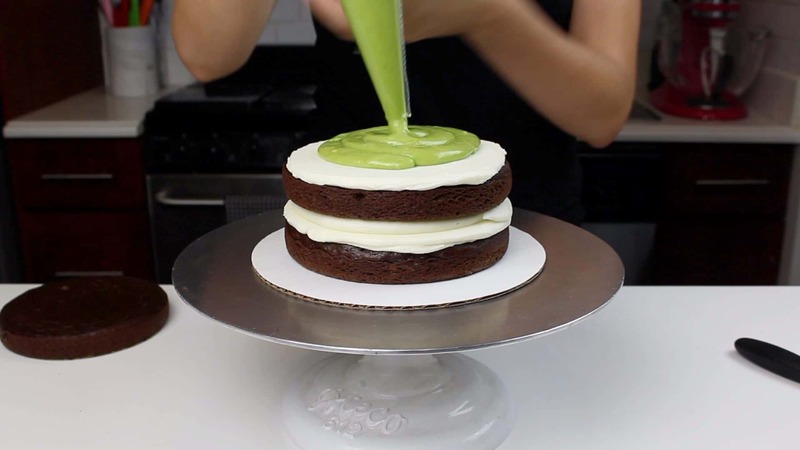 Begin by baking 4, 7-inch chocolate avocado cake layers, and preparing the avocado frosting and american buttercream. Once the layers are fully cooled, stack and frosting the cake layers. Spread an even layer of vanilla buttercream on the cake layer, and chill the cake in the freezer for a couple minutes. 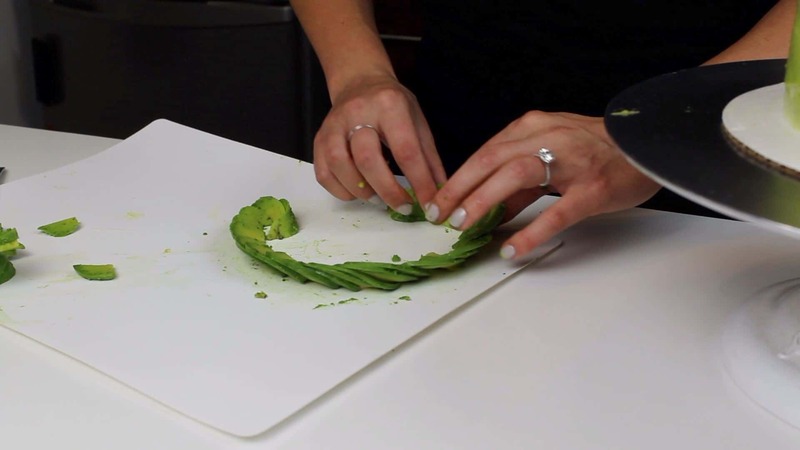 Once it has started to firm up, Pipe a second layer of avocado frosting on top of the first layer of frosting, leaving a 1 inch boarder. 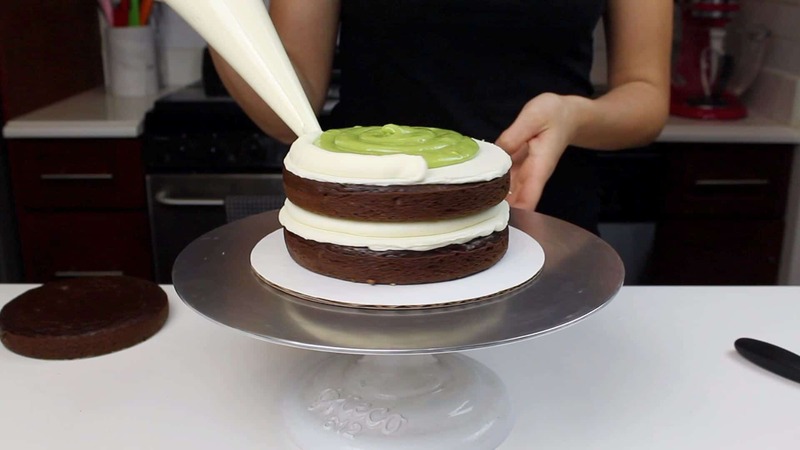 If desired, pipe a ring of vanilla buttercream around the avocado buttercream, to ensure it does seem out the sides of the cake. Repeat this process with the remaining cake layers, until they are all stacked. Cover the cake in a thin crumb coat of vanilla buttercream. Chill in the freezer for about 5 minutes, until the frosting is firm to the touch. 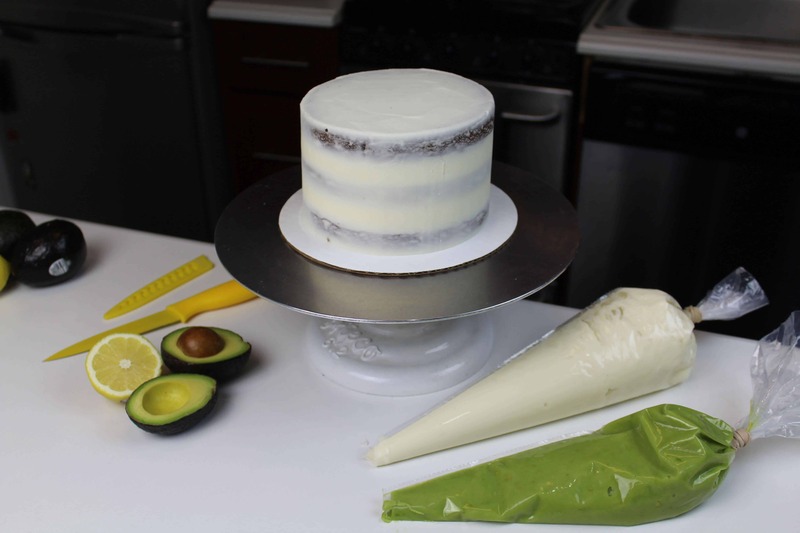 Next I went a little rouge, and decided to just cover the whole cake in avocado buttercream! To really get the avocado point across, I decided to place an avocado rose on top! Before this avocado-inspired baking streak, I’d never purchased an avocado, let alone made an avocado rose!! But YouTube is a beautiful thing, and after watching a quick tutorial, I tried my hand at making my first avocado rose. 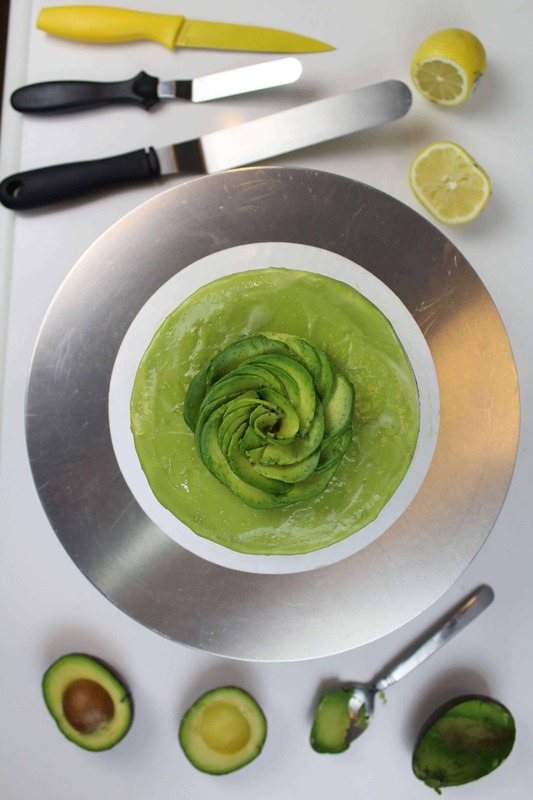 The most important things to keep in mind as you make an avocado rose? 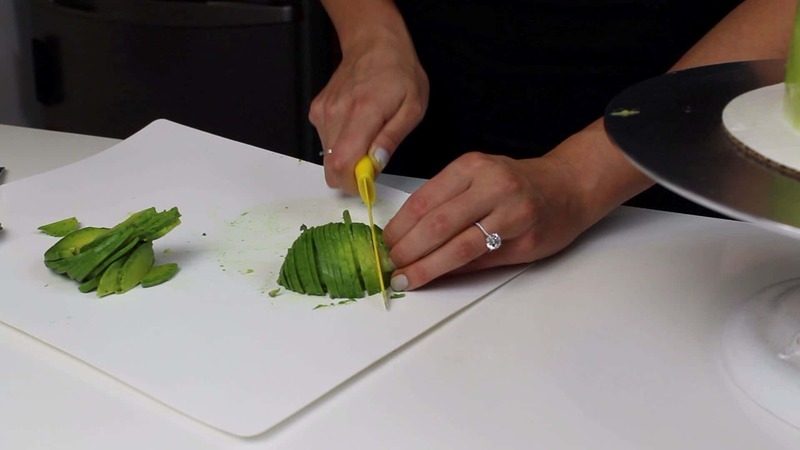 Try to cut the avocado as thinly and uniformly as possible. I don’t really cook, so my knife skills are far from perfect (please see the destroyed avocado I tried to quickly cut on the left side of the cutting board). I think my avocado may have been slightly overripe, but it still came together pretty well! I was very gentle as I shaped my avocado slices into a tall U shape, and then rolled the whole thing into itself, to create a swirl. Once it was fully shaped, I fanned out the edges of the avocado rose to give it a bit more life, and sprinkled some lemon juice over it to prevent it from browning. This is a play on my go-to chocolate cake recipe, but I've swapped the butter for avocado! 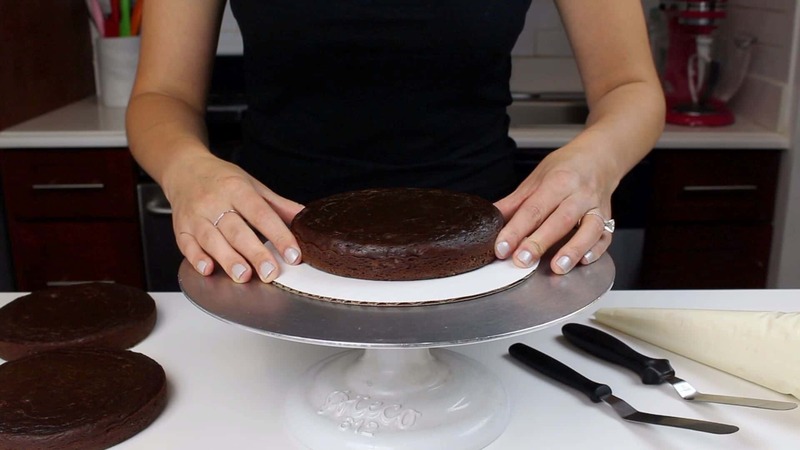 The result is an indulgent, moist chocolate cake with subtle hints of avocado. Pour in half of the buttermilk / cocoa mixture, and gently pulse the mixture to incorporate the liquid (if you don't, you'll end up splattering the cocoa mixture all over you kitchen! This is a smaller batch of my favorite vanilla buttercream! It's great for a batch of cupcakes, or a smaller cake (6 inches or less). Hi Chelsey- When making a multi layered cake, how do you keep the buttercream frosting from slouching or buckling at the base of the cake?